Buy the Zobeck Gazetteer from RPGNow or Amazon. You too can earn money from writing articles by signing up for InfoBarrel. Zobeck Gazetteer (Pathfinder RPG) by Wolfgang Baur is a role playing game supplement published by Kobold Press for use with Paizo Publishing's Pathfinder role playing game. Zobeck is described as being a crossroads trade town for the Midgard campaign setting with a central/eastern European feel to it. The city also has a "clockpunk" feel to it; clockpunk is based around the extensive use of clockwork, rather than the steam of steampunk, and tends to give a lower level of technology than the latter. This edition should not be confused with the similarly-named Zobeck Gazetteer, an older, shorter supplement. The Gazetteer is available as a PDF from RPGNow. The usual price is $9.99; however, it was purchased at a reduced, deal, price of $4. The book is also available in a printed version, although not as print on demand; the one reviewed was the PDF. This is a 117 page primarily black and white PDF. Two pages are the colour front and back covers, two pages are the front matter and Open Game License and one page the Table of Contents. Each of the eight chapters, and the Introduction, has a full page illustration at the beginning. The illustration for the Introduction is in colour; the others are in black and white. With the supplement being designed for use with the Pathfinder role playing game, some of it is covered by the Open Game License, and therefore some of the material is Open Game Content. Credit: Pat Loboyko/Kobold PressThe one page Introduction briefly considers the city, adding it to other campaign worlds and the Midgard campaign setting. A History covers the history of Zobeck, from before humans lived there and the fey were resident, to the rebellion that resulted in Zobeck being a free city and up to the present day. The Free City of Zobeck gives an overview of the various districts of the city, life and culture in the city, technology and magic, trade, religion, government, the laws and some important factions and influential families. The factions are covered in more detail in later chapters. Chapter 3, The Kobold Ghetto, covers one of the more interesting, and potentially dangerous for non-kobolds, districts of the city, giving an overview of some areas, including those under the city itself. Districts & Locations goes through the other districts of the city, with details on some of the locations in each provided. Gangs, Guilds & Guardians covers various factions of the free city, including those on the wrong side of the law, the guilds, and the Winter Court of the fey. Gods, Cults & Relics of Zobeck covers religion, including the various gods of the city, major, lesser and simply saints, prohibited cults, and various religious relics and their powers. The more unusual sect of the Crab Diviners is also detailed. Chapter 7, Denizens of Zobeck, is basically the descriptions of a number of non-player characters, including their Pathfinder stats, personality and motivations, and what plots they may be involved in. These NPCs are encountered in the various adventure supplements set in the city. The final chapter, Magic of Zobeck, introduces some new magic. There are two new magic schools, one of which is clockwork magic, new spells, many from the new schools, new magic items and a brief overview of magic shops in Zobeck - there aren't any real ones. The PDF is well bookmarked and the Table of Contents is quite thorough, making it easy to navigate. The illustrations are decent enough, and add a touch of colour - although largely not literally - as they often illustrate the accompanying text. There are also a lot of small sidebars throughout the book; many of these provide adventure hooks. Should these be used, there are an awful lot of potential adventures, although work will need to be done to expand upon them. There are quite a few references to other supplements set in Zobeck, especially in the chapter containing most of the NPCs, such as Alleys of Zobeck, Streets of Zobeck and Tales of Zobeck, and it really needs those supplements to make the best use of the city. Many of these are adventure supplements, and some details provided in this book are expanded in those. The Zobeck City Map will also prove useful. Being an independent city-state, Zobeck can be placed in other settings without too much trouble, and not just in the Midgard setting. However, although the city can work by itself, the supplement itself doesn't work so much. There are also references to supplements from the overall Midgard game setting; overall setting books could be skipped, and it will work without that setting, if it wasn't the case that there are references to material and races covered in those books. Consequently, by itself, a lot of additional material would need adding or creating to make the best use of the material actually provided in the Gazetteer, material that is covered in other Midgard and Zobeck supplements. For the city of Zobeck itself, there's a reasonable, but not overwhelming, level of detail provided. At 117 pages, this isn't the longest citybook around and, given the size of it, there's actually a substantial percentage of the book spent on magic in Chapter 8, which it might have been better to farm off into another supplement. The clockpunk framework of Zobeck is a bit different to the norm, but it might be unbalancing in other worlds where similar technology doesn't exist, and without it, Zobeck loses a lot of its uniqueness. The fey, who play an important role, both in the history of Zobeck and in the present day, seem to have more in common with the Sidhe than with Tolkien elves; in fact, they don't seem to have as much in common with similar beings from Central and Eastern European mythology, which is a bit odd for a supplement that intends to detail a city with the feel of that region. 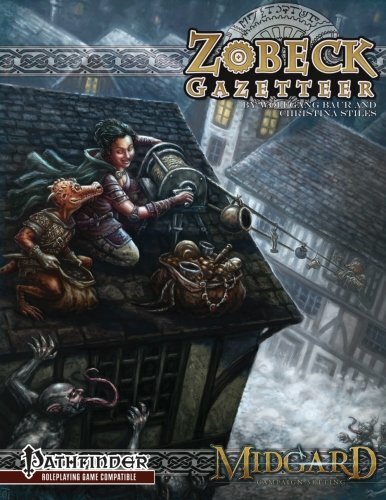 Zobeck Gazetteer (Pathfinder RPG) is an interesting supplement that could be used in other campaign worlds, but it shouldn't really be considered a standalone supplement, as without some of the other books, too much information will have to be created.